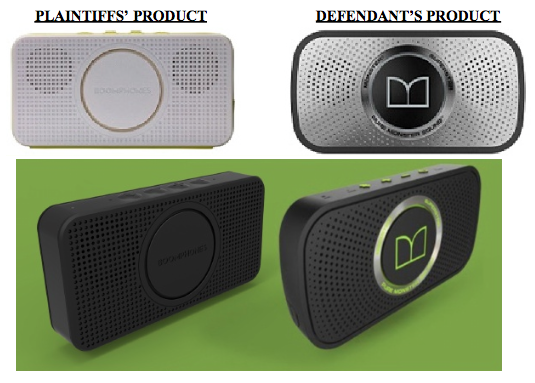 Plaintiff Carbon Audio d/b/a Boomphones, a Portland-based technology company, alleges that California-based competitor Monster Inc. has created a knock-off of Plaintiff’s “Pocket Speaker” product. Monster’s “Superstar” speaker is claimed to have the same internal and external configuration, as well as copying the distinctive and proprietary sounds of Plaintiff’s product. Monster’s Superstar speaker is set to go on sale on March 14 and has allegedly already led to instances of consumer confusion, so Plaintiff has filed a Motion for Temporary Restraining Order (see Memorandum below). Monster has already filed its Memorandum in Opposition to the Temporary Restraining Order. This lawsuit is moving fast out of the gates so stay tuned for updates. Carbon Audio LLC et al v. Monster, Inc.